Spinal Decompression is a non-surgical and drug-free answer for disc related syndromes of the lumbar and cervical spines when chiropractic, physical therapy and traditional allopathic treatments fail. Many people across the country have found relief from pain associated with herniated discs, bulging discs, facet syndrome, degenerative joint disease, pinched nerves and other spinal disorders. Spinal decompression uses computer aided technology to apply gentle, non-surgical decompression to your spine. There is a big difference between traction, distraction and decompression therapy. 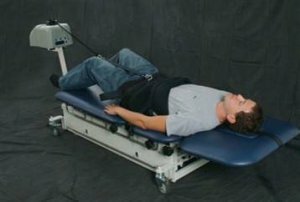 Decompression therapy is a unique combination of restraint, angle position and equipment engineering. This FDA cleared technology relieves pain by enlarging the disc space.Spinal decompression therapy reduces pressure inside the discs of the spine and facilitates the transfer of nutrients and oxygen back into the disc, allowing the herniated and bulging disc to eventually go back into normal position. According to a clinical study performed by the Orthopedic Technological review in 2004, 86% of all cases experienced spinal pain relief with decompression. Be careful when finding a doctor that claims that their Decompression table is the only table that provides true spinal decompression. This is only a marketing gimmick and completely false. The FDA cleared several types of tables. All true decompression tables do basically the same thing, although some have fancier options with costly marketing plans that make them extremely expensive. In my practice, I use the Dynatronics DX 2 because I believe it utilizes the latest technological advances at a cost that allows us to provide an extremely costly procedure at a price most people can manage in today's cost prohibitive environment. Why doesn't insurance pay for spinal decompression?As with most new procedures, like Lasik eye surgery, the insurance companies take their time in reimbursing for these procedures. We all know that Lasik eye surgery works but most insurance carriers still do not pay for it. Each treatment session averages 25 to 30 minutes in duration. On average, herniated discs generally respond within 20 sessions. Still other patients, due to life style or occupational stress, may require up to 25 to 30 sessions to achieve complete remission of their pain symptoms. Please call us to schedule your consultation with Dr. Rulli and learn if you are a candidate for Spinal Decompression Therapy. 804-261-6685.